During a recent WDW Radio Show our own Ryan P. Wilson joined Lou Mongello on a trip back in time to 1986. During their journey the topic of annual passes came up, notably the older passes from back on the late 80’s and early 90’s. Back in those days, in a time before Disney’s implementation of the biometric finger scan, which measures the size and shape of the guests’ fingertip, annual passholders would actually have to go and have their photo taken in order to obtain their passes. These photos were then cut out, and glued onto the back of your annual pass. The idea was to make it difficult for people to illegally use the passes of others. 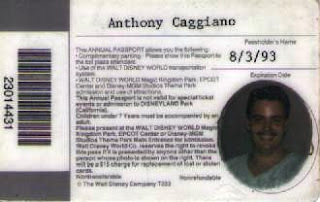 While I understand that, as technology progresses there will be changes, I still miss the photo annual passes. I enjoy looking back at them, like a snapshot in time, to a day when I was not worried about anything other than the good times that were out there waiting for me and my new annual pass. I remember they even took your picture for the park hopper pass! !